Wacky Watercooler January 2017 Mini Blog Hop #1: Occasions Catalog is Here! This month we’re offering two mini hops since the Occasions Catalog and the Sale-a-Bration brochure just went live January 4th. 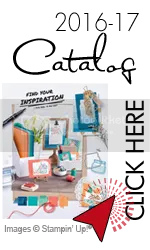 We’re showcasing the new Occasions Catalog and also the freebies from the Sale-a-Bration products. Are you wondering how we all created projects with products that were just available as of yesterday? 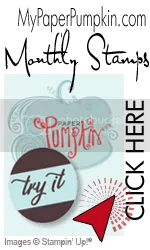 We’re all Stampin’ Up Demonstrators! And…we get our hands on new product a month early. If that sounds good to you check with your demonstrator and sign up today so you’ll be ready for the next new catalog early. And…demonstrators can earn additional free goodies during Sale-a-Bration! Okay…back to the hop. Hee, hee. Now that you’re here I hope you’ve arrived from Christine’s blog. Amazing work as always Miss Christine. Not only is Christine a wonderful friend but she fire’s up my creative mojo every time with her shared projects. For today’s hop I’m concentrating on one of my favorite forms of card. The notecard! A tad smaller than the traditional card size but still mailable with standard postage. I love that they come in a pack of 20 for a mere $6.00. And…they include the envelopes and are already scored and ready to fold and go! Other: Big Shot, Detailed Dragonfly Thinlit Dies, 1/4″ Very Vanilla Satin Ribbon, Bone Folder, Paper Snips, SNAIL, Tombow Liquid Glue, Dimensionals. A very quick and easy card. Fold and crease the notecard, tie on the new luscious ribbon, die cut a grouping of dragonflies (it’s all in one die so easy to cut and glue down). 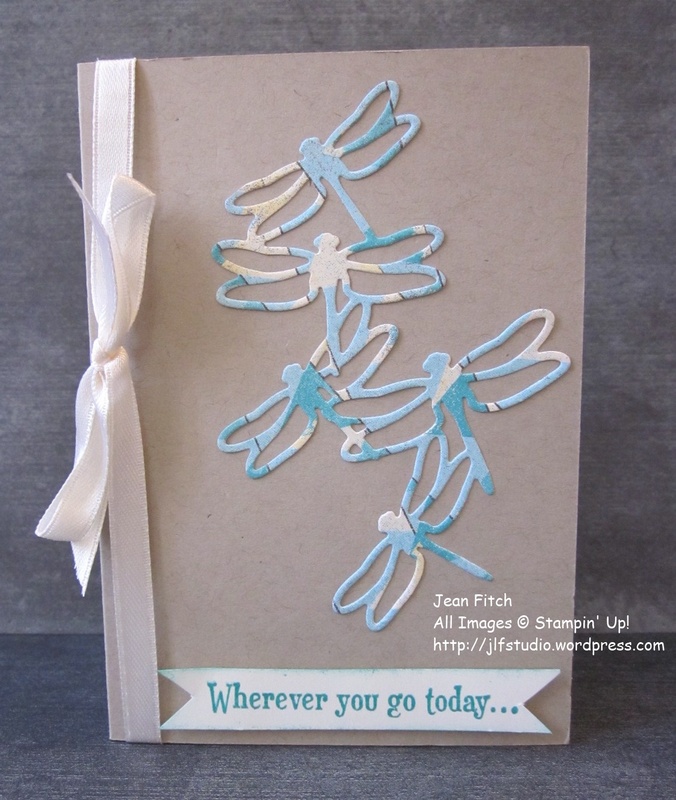 And lastly, stamp a sentiment from the new Swan Lake set ( I love the idea of dragonflies not exactly having a plan for their travel don’t you? ), banner cut the ends and apply with dimensionals. Stamp a few images from Swan Lake on the inside and you’re done! Oh…and the notecards use regular postage so no worries there. Other: Big Shot, Detailed Dragonfly Thinlit Dies, Bone Folder, Urban Underground Washi Tape, Paper Snips, SNAIL, Tombow Liquid Glue, Dimensionals. In this version of the notecard I played a bit more with papers and replaced ribbon with washi tape (easier and more affordable so I love that trick. Easier to mail too!). The only tricky bit was die cutting a set of dragonflies out of Very Vanilla and then tapping the die cut on the Delightful Dijon ink pad to add a bit of color and definition. Not really all that tricky but a tad messy that’s for sure unless you use a plastic bag or over cover to keep the ink off your fingers. I slipped a bit of the same carousel paper behind the Urban Underground. I thought it gave a bit of a watery background look for the dragonflies. They do so often fly over water right? I encourage you to play with the products that I’ve showcased today. Quick and simple meets the need so often. 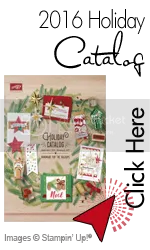 And as you can see, the products I’ve used will coordinate with products you may already have or can find in the Stampin’ Up Occasions and Annual Catalogs. Don’t forget…from January 4th through March 31 your purchases may also earn you extra SAB freebies! Sweet! That’s it for my share of the hop. Time to move on over to my friend Marsha’s blog. Marsha is not only an original and crafty lady in so many ways and areas but she’s also our fearless leader this time around. She stepped in at the last minute when Heidi came down with a winter case of pneumonia and is away from the keyboard. Bless you Marsha for stepping up and I know we’ll be inspired by her hop contributions. Enjoy the rest of the hop and I hope to see you back here soon. Love your notecards, Jean. I just ordered some notecards so will be using your ideas for some of them. That stamp set and die bundle was in my initial preorder. I always forget that the notecards are mailable too Miss Jean, so it was a good reminder to add a pack to my Occasions order. 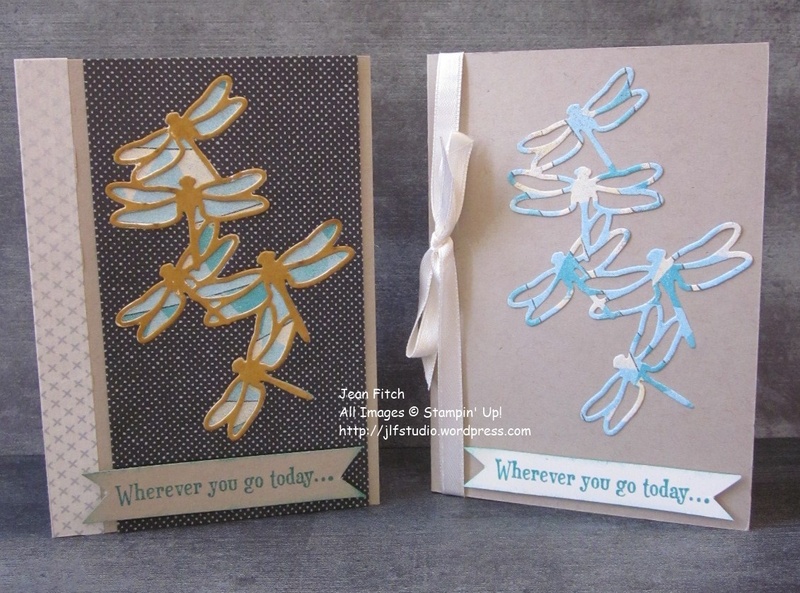 What delightful cards you’ve created with the Dragonfly set. Beautiful! Thanks for sharing as always. Jean, beautiful cards!! I love the swan lake sentiment with these images. Wow, the Dragonfly cards are gorgeous. I can’t wait for my order now. You have made two beautiful cards. The Detailed Dragonfly Thinlits Dies are fabulous. Love what you did wit them. I love the greeting you choose from Swan Lake, it went perfect with the dragonflies! I’m just might have to get the Swan Lake set for that greeting! Great card! I just got my bundle today, so in love with the magical dragonflies! 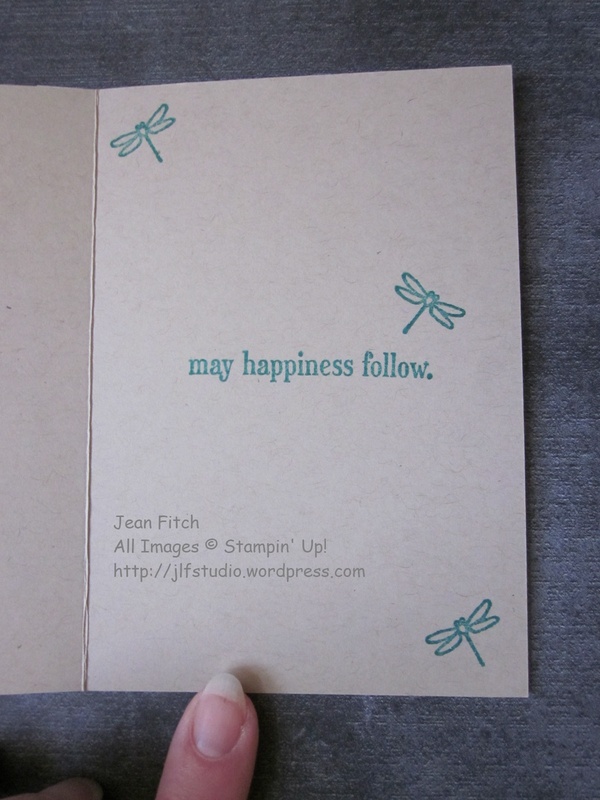 Very pretty dragonfly cards, Jean! Lovely cards, Jean; the stepped up card is a version of perfection–so ethereal! This was one of the first sets I marked in the Occasions catalogue when I saw it at OnStage. Love how you’ve used it. Great idea to use the notecards – I never think of them. Thanks for the reminder! Wonderful card, Jean! Love these dragon flies! 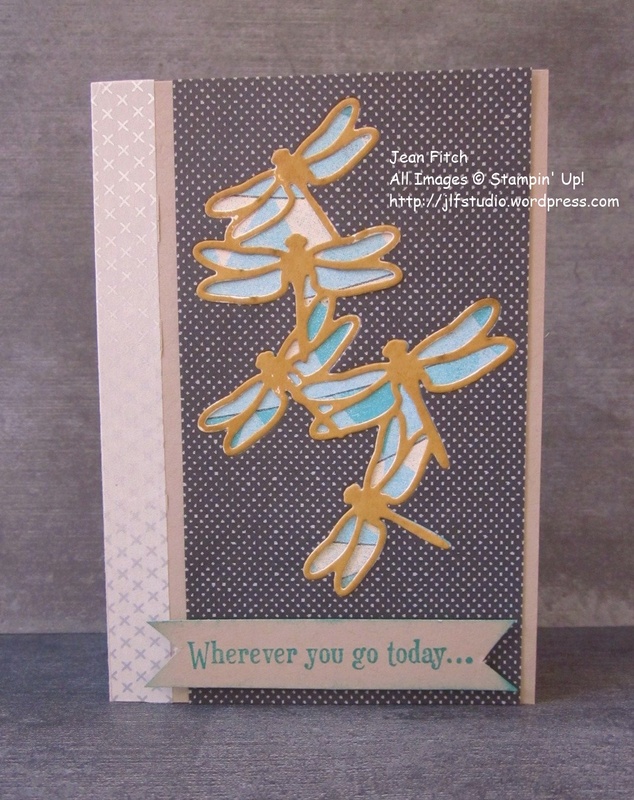 Love your dragonfly cards!! I didn’t get those items and now you’re making me regret it! !